Japanese gardens are extremely popular designs that many people have started incorporating into their gardens at home. The beauty of a Japanese garden comes from the blending of many different elements of garden design, especially rocks, sand, water, ornamental items, along with natural plant life and surroundings. Many Japanese gardens use religious symbolism from the Shinto and Buddhist beliefs. Fundamentally, Japanese gardens are designed around three essential principles: symbolism, miniaturization, and borrowed view. Just about every Japanese garden uses symbolism in one form or another. For instance sand and gravel beds would symbolize various rivers, while rocks and stones would be grouped together to represent islands. Japanese gardens will frequently recreate famous locations and scenes into smaller, more easily managed spaces. The third element of borrowed view, otherwise known as Shakkei, is using a location’s existing plants and scenery to blend with the garden designs. 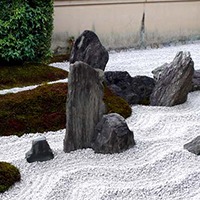 Japanese rock gardens are usually created so that the garden itself blends with the existing environment. Karesansui are waterless Japanese gardens that are sometimes also called Zen Gardens. 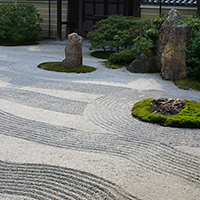 The first Zen garden of this type is credited to the Kenchoji Temple in Japan, which was founded in 1251. This style of garden was typically found in the residential gardens of Zen abbots. Sand and rocks are the main elements of this type of garden. Rivers and oceans are not represented by water, but rather sand that has been hand raked in ripple patterns to mimic water. Rocks and boulders are added to the gardens and most often symbolize different Chinese mountains. Japanese gardens are frequently designed to be viewed from one direction, and seating is often added to the Karesansui so that visitors can sit and contemplate the garden design. Raking the sand or gravel into patterns that represent water or waves is not an easy thing to accomplish. Zen priests actually will practice the technique for years as an exercise to help them with their concentration. 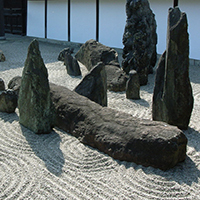 The patterns that are put into the Japanese rock gardens are generally not static either. Coming up with new patterns is often considered an inspiring and creative challenge for the designer. 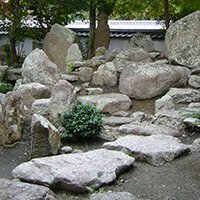 To represent land, Japanese gardeners would often shape shrubs and plants for various effects, and moss was grown as a ground cover to symbolize land. The amount of thought and symbolism that is put into these gardens is often considered unmatched compared to other garden designs. Kasan: The term Kasan literally means “artificial mountain” and refers to the use of modeled mountains in different Japanese gardens to represent real mountains, or those of legends. The models would be made out of odd shaped stones, dried wood, and even ceramics, and were often incorporated into Japanese gardens. Originally started in China, the practice of adding miniature mountains became very common in many Japanese garden designs. Tea Gardens: Tea gardens are another common style of Japanese gardens although contrary to what the name implies, they were not designed for simply drinking tea. A typical tea garden will actually consist of several smaller gardens alone a stepping stone path. These gardens will typically include Japanese lanterns, a water basin, the stepping stones leading you along the path, and the waiting place, also called “Machi-ai”. The garden itself serves as a passage from the world outside, to the calm and peaceful inner teahouse where the actual ceremony is performed. The purpose of the path is to allow the visitor to enjoy each aspect of the garden, and to clear their mind of the outside world before arriving at the teahouse. 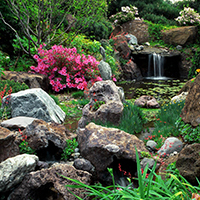 Creating a Japanese garden around your home or backyard is not always a simple task. There are a lot of design elements that go into these gardens, but that’s not to say yours has to be elaborate or complicated. You can go as big or as small as you like in your garden.